Junior Coach Jonathan leading a race with K–2 students during recess. 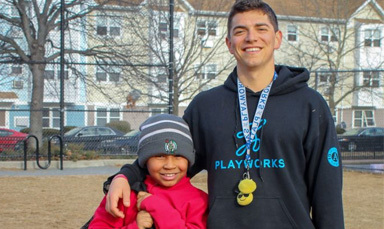 Junior Coach Jonathan is a 5th grader at the Mason Elementary School in Roxbury. Jonathan has stood out this year as a role model, not only for younger students but for his 5th-grade peers as well. Jonathan knows what is expected of him as a Junior Coach and works hard to give every student at the Mason the best possible recess experience. 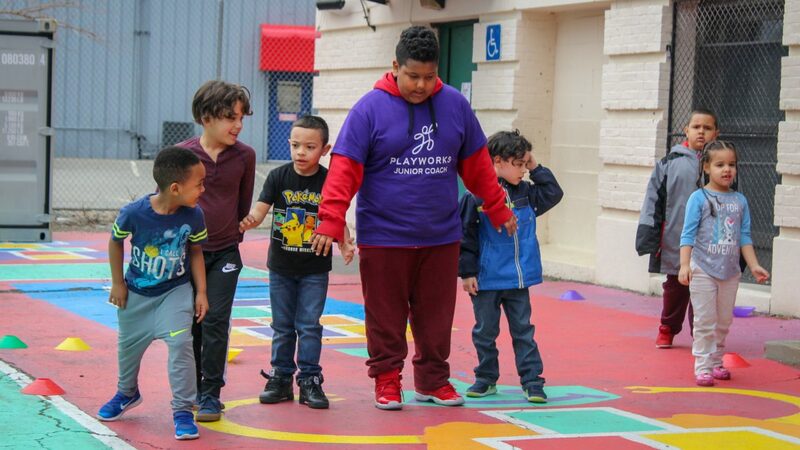 According to Coach Jason, Jonathan always models “positive communication and problem-solving techniques,” whether he is playing with K–2 students during his recess shift or with 5th graders in his own class. Jonathan has gained a lot of confidence since becoming a Junior Coach. Coach Jason has been working with him on speaking in front of large groups. He was nervous at first, but now Junior Coach Jonathan is able to open up a recess all by himself! Coach Jason knows that he can always count on Junior Coach Jonathan to show up early and set a good example for other students and Junior Coaches. 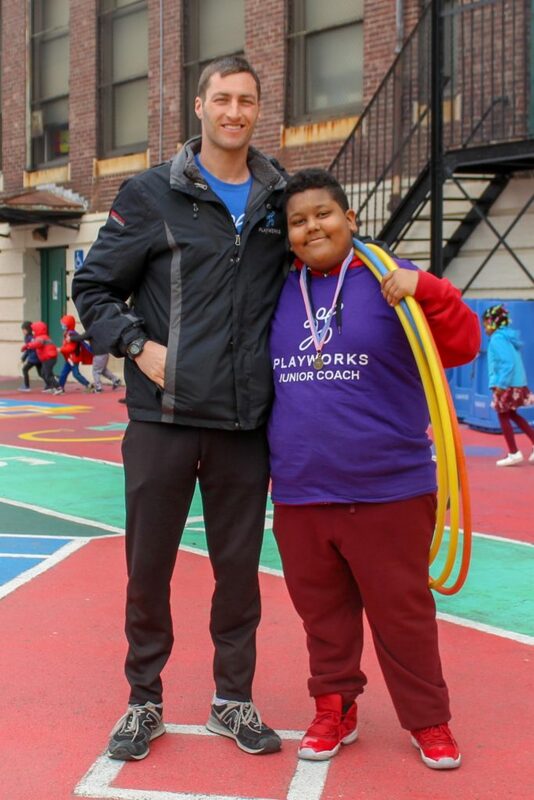 We are proud to have Jonathan on our Playworks team at the Mason. We know he will continue to make a difference every day by being a responsible and committed leader in his school community. Q: How does it feel to be selected as the Junior Coach of the Month? It’s an honor. I just do the stuff I’m supposed to do, like help with materials and help other Junior Coaches learn the stuff that Coach Jason teaches us. I’ve just been trying to be early to prepare, getting materials, getting my Junior Coach shirt, signing in; I’ve just been doing the stuff that an ordinary Junior Coach is supposed to do. Q: What’s your favorite part about being a Junior Coach? I love working with kids. I love teaching them. 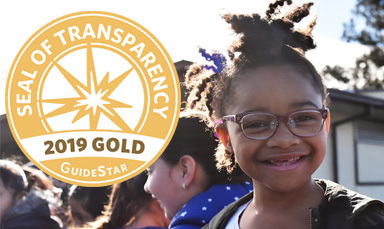 My main priority is helping them learn and helping other kids learn what Coach Jason teaches us, like inclusiveness and flexibility and responsibility, so they can become better citizens overall. Q: What have you learned from Coach Jason at Junior Coach Training? I’ve learned that having strategies and being responsible is a good thing in Junior Coaching because it’s your responsibility to be on time and to get materials and do what you’re supposed to do, so the kids can have an enjoyful time. 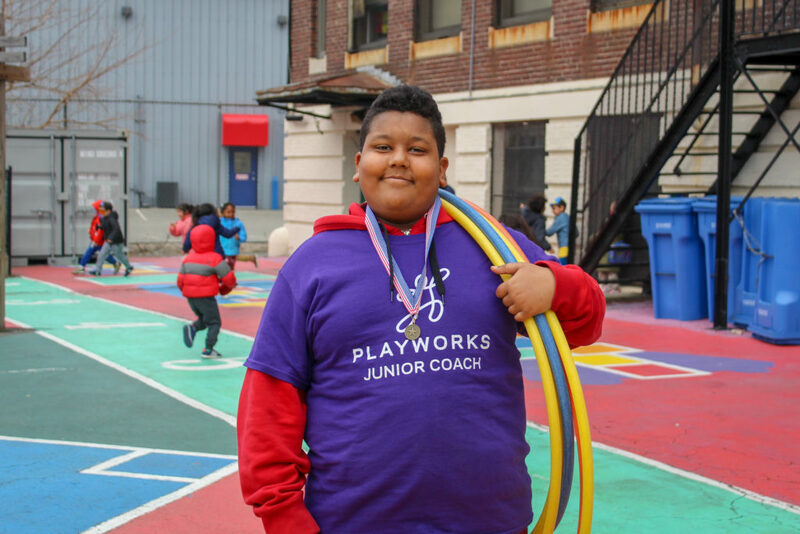 I’ve also learned that Playworks helps with other stuff in the world and in school about playing and being a nicer person. Q: What advice would you give to other Junior Coaches who want to be successful? You know, just do what you’re supposed to do because being a Junior Coach is a privilege. So teach the kids and play with them and teach them the stuff that you’re being taught. Q: What is your favorite game to play at recess? My favorite game to teach—there’s a variety of them—one of them is Night at the Museum. I like a lot of the tag games, like Flag Tag. Hula hoops is another popular game.